Much of what Donald Trump has done since his inauguration hasn't been normal behavior for a U.S. president, and he has stretched the limits on what's viewed as ethical. But so far, none of it seems to be illegal. Trump has resisted calls to divest from his business empire and is using campaign funds to pay his own companies and his legal bills. He's appointed Cabinet secretaries who are dismantling or ignoring their departments rather than promoting them. And he has engaged in petty acrimony with perceived antagonists too numerous to mention, ranging from the NFL to the mayor of San Juan, Puerto Rico, to the heads of his own Justice and State Departments. Trump's enthusiasm for riding roughshod over the boundaries adhered to by previous presidents shows the weaknesses of an oversight system that predates him, ethics experts say. "What we're seeing right now is this sort of perfect storm of long-standing problems that long predated the president that have been exacerbated by his decision to discard a lot of norms that constrained his predecessors," said Dan Weiner, senior counsel at the Brennan Center for Justice at New York University. "It's a formidable combination of old problems and new problems." In January, the president bucked hopes that he would completely separate himself from his businesses after his election, announcing at a press conference that he would distance himself from the Trump Organization but had no plans to sell his company off. Ethics experts agree Trump would have to divest his businesses entirely and place the resulting funds into a blind trust to truly ensure separation, measures he has refused to take. The Trump Organization, now run by the president's two eldest sons, Eric and Donald Jr., has sought to capitalize on Trump's political appeal with a new hotel brand, American Idea, targeted at his base. Despite promises of no foreign deals while Trump is in office, the Trump Hotels website states the company is currently expanding its portfolio and seeking "global opportunities" for developments. Watchdog group Citizens for Responsibility and Ethics in Washington was first to note the wording. Trump's hotel at the Old Post Office in Washington, D.C., a hotbed of potential conflicts, has seen an uptick in profit with Trump in the White House. And while the president has said he will donate foreign profits from his hotels to the U.S. Treasury, he has yet to do so. "It's not just unusual, it's unprecedented," said Meredith McGehee, chief of policy at watchdog group Issue One, of Trump's bending of ethics norms. White House spokeswoman Natalie Strom declined to comment on the matter. Walter Shaub, director of the U.S. Office of Government Ethics, in July resigned from his post over Trump. "In working with the current administration, it has become clear to me that we need improvements to the existing ethics program," he said in a statement at the time. The president and vice-president are not covered by conflict-of-interest laws that govern other administration officials, but there has been a long tradition of presidents creating walls between their public service and private interests. And Trump has one predecessor whose ethics may provide a touchstone: Richard Nixon. The 37th president, the only man to resign from the office, said after leaving the White House, "Well, when the president does it, that means it is not illegal." Some have questioned whether Trump's activities might be in violation of the Emoluments Clause of the Constitution, which bars the president, as well as any officer of the federal government, from accepting gifts, emoluments (salaries, fees or profit), offices or titles from foreign states. But thus far, nothing has stuck. Recently, legal defense funds being set up for Trump staffers tied to the Russia investigation have come under scrutiny. There was confusion over OGE rules barring anonymous gifts to such funds. "Clearly, there is a need for the OGE to start rule-making and to clarify what the rules are for executive branch officials that feel the need to establish a legal defense fund," McGehee said. "These are all questions not sufficiently answered for the public, at least under the current guidance." There is no ethics mechanism to prevent Trump from firing Special Counsel Robert Mueller, who is now heading the Russia investigation. While such a maneuver might look bad, it would not be illegal, just as it wasn't illegal for him to fire former FBI Director James Comey. Government ethics guidelines are, by and large, squishier than campaign finance rules. Trump has pushed the limits there as well, but he has generally stayed within the lines. Trump filed paperwork for his 2020 campaign within hours of his inauguration, allowing him to start fundraising right away. His reelection campaign has already paid over $500,000 to his own companies (on top of the more than $12 million paid to his companies during the 2016 election). Republican committees have paid at least $1.3 million to Trump entities in 2017, according to an August report from The Washington Post. "In terms of campaign finance rules, people are saying that it's unseemly for him to be paying his own properties and venues, but so far I've seen no evidence of any illegal conduct," said Rick Hasen, University of California election law expert and author of the Election Law Blog. "It's just people find it to be distasteful." "The fact that he is raising money for his 2020 campaign and then having the campaign patronize his businesses is not per-se illegal," said Weiner, who previously served as senior counsel to Federal Election Commission Commissioner Ellen Weintraub. "It certainly raises concerns, and if I were his lawyer, I would probably say, why risk creating that image? Why don't you just not do it? But obviously his lawyers don't agree with that." FEC rules bar candidates from converting funds to personal use, meaning they can't use campaign money to pay for items such as their mortgages. 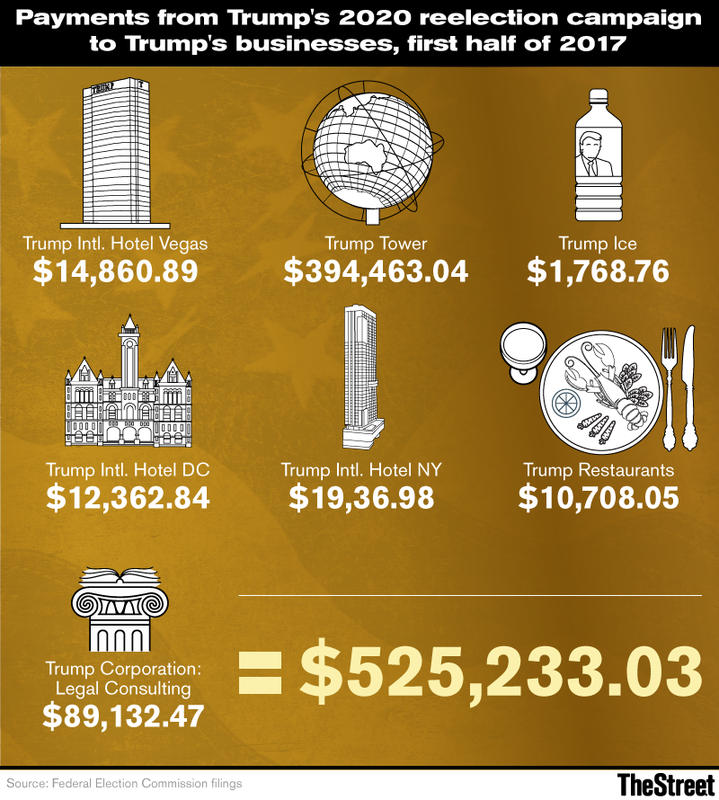 But when it comes to renting commercial real estate space -- such as the Trump campaign setting up shop in Trump Tower, or the Republican National Committee holding an event at Trump International in Washington -- it's fair game, provided that rental services are provided at fair market value -- as in, what they would charge anyone else. Beyond real estate, the question of campaign payments to Trump-owned entities enters more "legally murky waters," said Paul S. Ryan, campaign finance lawyer at watchdog group Common Cause. It is possible that the FEC would apply the same fair-market-value rules, but the commission has never weighed in, and Trump hasn't asked for any guidance. "He just proceeded with his campaign and having his campaign use campaign funds to buy goods and services from businesses that he owns," Ryan said. Trump is also using campaign and RNC funds to help pay for the team of attorneys representing him in the probe into Russian meddling into the 2016 election and possible collusion between his campaign and Russia. FEC rules mandate that as long as what candidates use legal services for is directly related to their candidacy, their campaigns can fund it. "Most, if not all, of what President Trump is being investigated for arises out of his campaign," Ryan said. "And to the extent that he's paying lawyers to work on legal matters that arise out of his candidacy, there's no problem there. It's permissible." Reports that Mueller is looking at the Trump Organization and Trump's personal finance activities prior to his candidacy could be a closer call, but his lawyers could likely make the case that it's all related. Experts also note that even if the FEC were to decide Trump had violated some sort of campaign finance law, the commission is stuck in an ongoing deadlock along party lines. Democratic commissioner Ann Ravel resigned earlier this year in large part over the commission's paralysis. "We have an enforcement agency...that is completely broken," Weiner said. "The chance of them actually scrutinizing [Trump's] transactions is very small." "It could happen, but it's not going to happen," Ryan said. Editors' pick: Originally published Oct. 11.